This mod changes the training system to be more like that of Morrowind. If you want to use this, you can, but NOTIFY ME and give me credit. This is a very simple mod that still makes the game that much better. What Better Training does is make it so that you can train 10,000 times per level instead of 5--because if you have the gold, why not? Morrowind's training system was best (unlimited training), and this mod aims to achieve that--it practically has. 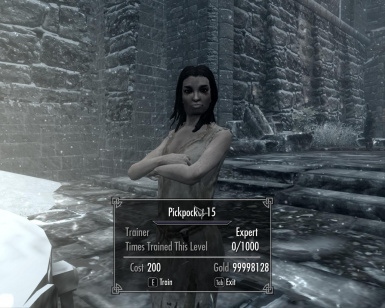 Since you will no doubt level up before you have the gold to train 10,00 times, it is in essence unlimited training. You can use this, but please give me credit and NOTIFY ME in a message. This mod is also on Steam. Just type in Better Training in the workshop search bar.